rrange a time and place, the #Bai people then greet each other by love songs,� said Wang Zhongkuan, vice chairman of #Dali Photographers Association, who has taken part in the Shibaoshan Singing Gathering in Jianchuan County, Dali Bai Autonomous Prefecture, for many years. 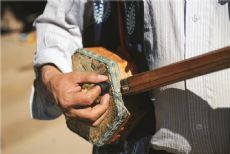 It has been a tradition for Bai people to express their affections through love songs. 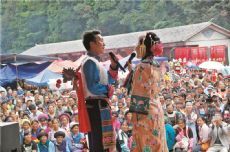 The Shibaoshan Singing Gathering, March Fair, Butterfly Fair, Raosanling Fair provide young men and women with the opportunity to meet each other through love songs in Dali. Among them, Shibaoshan Singing Gathering is the most famous. It is held annually from the 26th of lunar July to the 1st of lunar August in Jianchuan County. 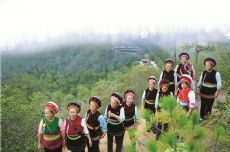 In Shibaoshan Singing Gathering, Bai women dress up in white embroidered apparels, and wear make-up, attractive headwear and aprons. The handsome Bai men dress up formally and play three-string lute. The singing is usually started with the males who decide the melody. Then the female singers will continue the love song. The melodious songs accompanied by three-string lute are fabulous. The gathering lasts for several days, starting from morning and ending at night each day,� said Wang Zhongkuan. ai seniors think it is auspicious to sing love songs in the gathering. The event is not only about singing skills but also about singers' wisdom and ability,� said Wang. Many excellent singers often make improvisation in turns depending on the situation. Wang Zhongkuan began photographing in Shibaoshan Singing Gathering since the 1980s, and witnessed many Bai men and women falling in love with each other during the gathering. The most impressive one are two seniors. According to Wang Zhongkuan, the two are not married. They used to know each other through singing, but they didn't get together due to various reasons. In the 1984 singing gathering, they met each other again and sang excitedly to greet each other. Wang Zhongkuan lifted up his camera and recorded the moment. The picture was named inging Love Songs till we get old�.